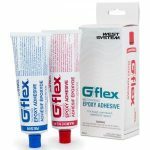 West System G/Flex 655 Epoxy Adhesive - Goosebay Sawmill and Lumber, Inc.
West System G/Flex 655 Epoxy Adhesive is a toughened, versatile epoxy that is conveniently pre-thickened for permanent waterproof bonding of plastic, fiberglass, ceramics, metals, damp and difficult-to-bond woods. With a modulus of elasticity of 150,000 PSI, it is a bit more flexible than standard epoxies and polyester, but much stiffer than adhesive sealants. This gives G/flex 655 the ability to make structural bonds that can absorb the stress of expansion, contraction, shock, and vibration. It is ideal for bonding dissimilar materials. Mixed at a 1:1 ratio, G/flex 655 gives you 45 minutes of working time at 72°F. It reaches an initial cure in 7 to 10 hours and full cure in 24 hours.